Britt-Marie Was Here, by Fredrik Backman, translated from the Swedish by Henning Koch, published by Sceptre, an imprint of Hodder & Stoughton, UK, May 3, 2016, 336 pp., paperback. 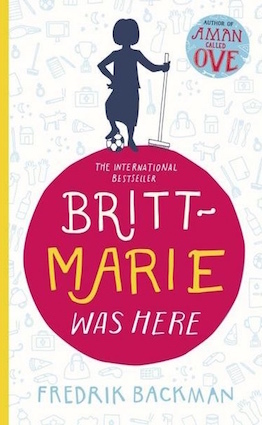 I did not like Backman’s previous novel, A Man Called Ove, but was spurred on to buy book no.3, Britt-Marie Was Here, by a very insistent salesperson in the Chapters bookstore, who had been so entranced by it that she was practically hugging her own copy. I bought it against my better judgment and I was underwhelmed all over again, despite trying my best to be objective. When Backman writes, he repeats certain words and phrases over and over, and makes each chapter and paragraph follow the same basic pattern, so that it sounds almost like a children’s rhyme, a medieval poem, or a traditional fairytale. The novel is nice but light-weight, like a pretty balloon. Because I do not agree with people categorizing a frothy piece of writing like this one as a literary masterpiece, I will, below, debunk the myth. In any case, when I see the words “international bestseller”, particularly “New York Times International Bestseller”, on a book’s cover I am immediately suspicious. The NYT bestsellers list is compiled by the editors of the “News Surveys” department, not by The New York Times Book Review department, where it is published. It is based on weekly sales reports obtained from selected samples of independent and chain bookstores and wholesalers throughout the United States. If you look at the books on the bestsellers list at any moment, you will see that quality of writing or concept is not the criteria. At March 26, 2017, Backman’s first novel, A Man called Ove, was still on the list at No.5. A novel by Danielle Steel was at No.3. Q.E.D. Here’s a reminder of what a fairy tale is, and in which style it is usually written. I suspect Britt-Marie Was Here is popular for three reasons: 1) Hygge is the In Thing. Everything warm, cuddly and Scandinavian is hot and has been for the past year. 2) The setting and the people are different from the usual North American and South European settings. 3) The patterned writing is soothing and easy to read, the effect being the same as reciting a fairy tale to children – you get all warm and fuzzy and nod off. Backman treats his subject very lightly indeed. The characters are stereotypes in both books I’ve read: An old man and woman who are set in their ways and anti-social, almost to the point of being on the Autism spectrum, meet various people who are completely different, who force them to engage with the world, and it all ends happily, implausibly and ridiculously easily. “Britt-Marie” tries to do something new. She has an encounter with other people, which irritates her. Other people look like idiots by comparison. She does not sleep a lot of the time, and she should’ve been off her head from lack of sleep, rather than trying to reform the town of Borg. There is nothing wrong with writing simply, concisely and crisply. Done well, such writing is elegant, focused and meaningful, as writers like Sjón and even Gerard Reve demonstrate. However, it is the lack of depth in the novel, particularly in the central theme (life is like a football game, or like balcony flowers) that made me think it is just not good enough. There is one violent death in the novel, but it failed to move me. 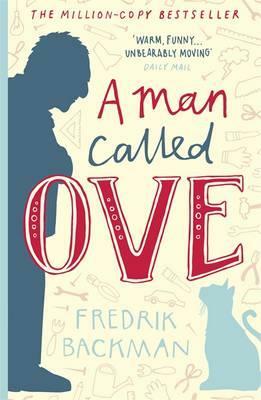 Poster of the film version of A Man Called Ove, by Fredrik Backman. The novel is pleasant, light reading, cheering, one way to pass the time. But there many other novels on the same subject that are deserving of the same praise, and that are better. So, if you want a book which may lull you but not stimulate your mind, read it by all means. If you expect better from this author, wait until his next book. Considering that A Man Called Ove has already been made into a film, Backman has mastered the recipe of writing popular fiction and there will be more by him. Also in mitigation, at least Britt-Marie rides off into the sunset on her own, and does not, as expected in a romantic ending, shack up with either her ex or the plump but well-meaning policeman. Here is what makes this novel very like a fairy tale. There are actually too many examples to mention. I know that every author has their pet phrases but it is just ridiculous to make characters so extremely limited and one-dimensional. Let’s just say that this novel does not stand up to deep scrutiny. Taking it apart exposes the weaknesses. Britt-Marie refers to the person she first meets in the cafe as “somebody” and from then on Backman calls the character “Somebody” as a name. The joke wears thin after the first few pages. Britt-Marie says “Ha.” a lot. Somebody says “Huh.” a lot. Every time Britt-Marie is stressed, she needs to clean something with “Faxin” or bicarbonate of soda. “Nag-bag” used 3 times on p. 41. Britt-Marie tried to form a family but her ex went off with a new woman and her step-children do not like her. This causes her life to fall apart. It is very important that she has someone to clean and cook for and the lack of a “purpose” distresses her. The reveal about the missing mother of the children she comes to know is seen as a major pivotal moment in the novel. The reconciliation between a puritanical father and his football-playing son is another pivotal moment. Government closed down the truck-stop town. Britt-Marie’s husband “Kent” left her. Sami, the good, sensitive (!) brother, dies defending his siblings. Literally, Britt-Marie goes on a journey, driving to the town of Borg. Britt-Marie has to get the football team together. She has to act as mother for some kids. She has to clean up Borg. Three “huh”s and a “Ha” on p.44. Britt-Marie dates Sven the policeman and is reconciled with Kent, her ex-husband. Borg loses a match but plays as a team. The town gets a football pitch. Britt-Marie drives off into the sunset to Paris, having gotten her mojo back.